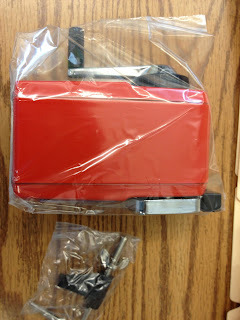 Rarely do I get excited about something as simple as a pencil sharpener, but I can hardly contain my excitement right now. 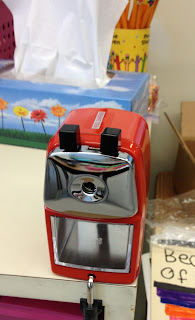 I finally got a pencil sharpener from Classroom Friendly Supplies!!! You know the one that I am talking about. It looks like a little robot, all cool and awesome. 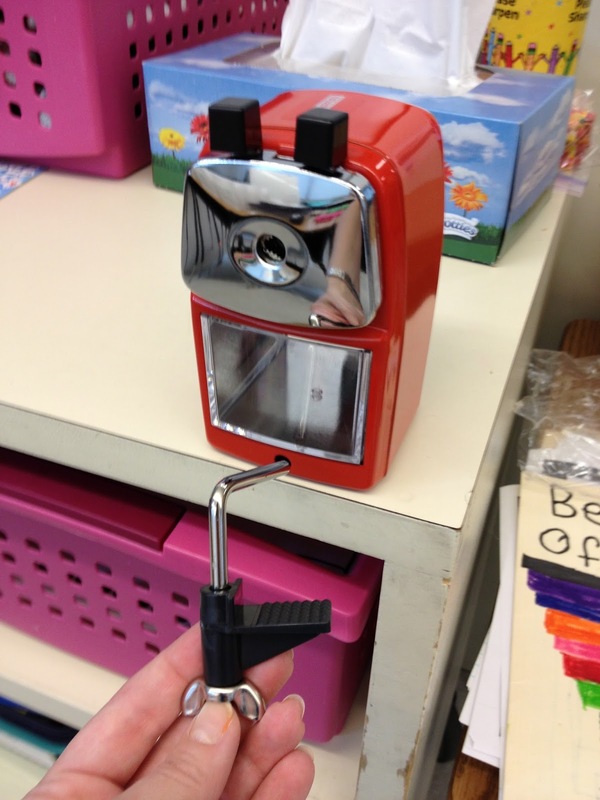 I've read so many blogs and so many pins and pretty much dreamed about this sharpener. 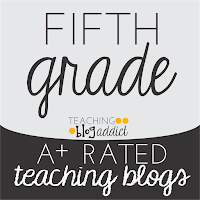 Well, Troy at Classroom Friendly Supplies was nice enough to share one with me so that I could share my review with all of you. How fantastically amazing is that? 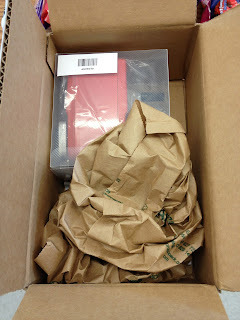 It's well-packaged. 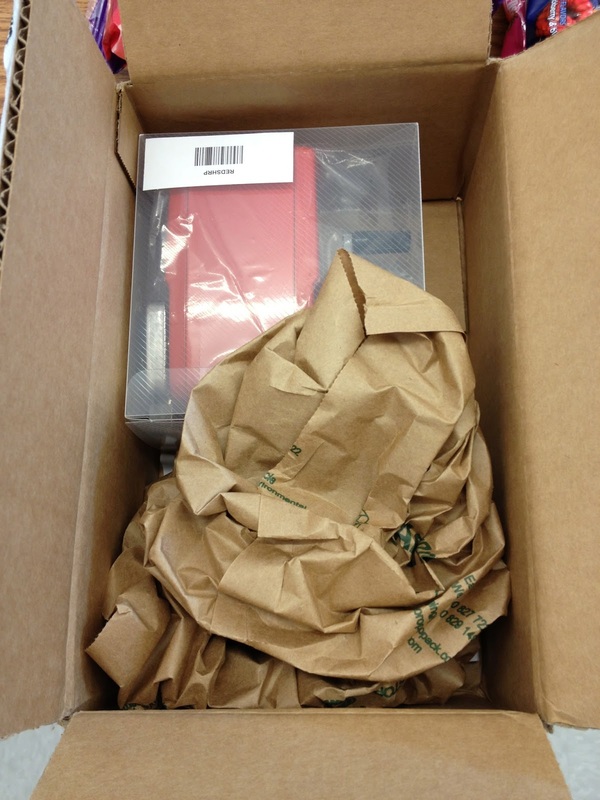 There's nothing worse than receiving a great product only to realize it is broken and with this great packaging, there's no chance of that! It comes in two parts. The main sharpener and the clamp. Before I walk you through my first experience with this sharpener, can I just say how super cute it is? It looks like a mini robot! I adore the way that it looks. I also love the very simple shavings catcher, which slides in and out very easily. Based on looks alone, I love it. But I had to test it out to find out if I should be truly in love with it. The clamp was pretty much the easiest thing on Earth to attach. It has a wide opening so that it will work well with a number of areas. A twist and a turn and...voila! It was ready to go! No assembly necessary, unless you count putting the clamp in the hole, which took less than a minute. So I was ready to sharpen. I could hardly contain my excitement. I stuck the pencil in. This was only tricky the first time. You have to squeeze the black knobs and then pull the front compartment out. Once you do this one time, it's easy breezy from there! It didn't take me long to get the hang of it! One hand free! 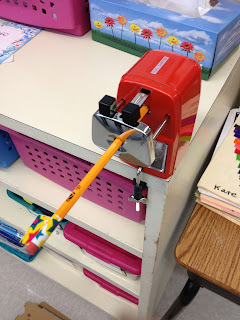 Something about me wanted to hold on to the sharpener, but that clamp really did keep it locked down securely so that all I had to do was turn the lever and the pencil was sharpening! 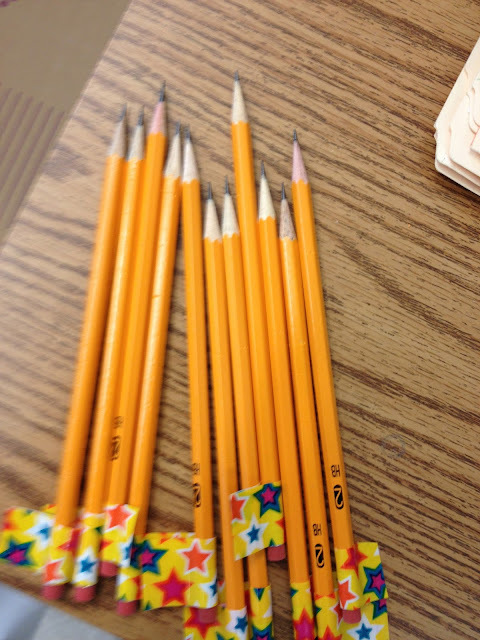 The tension will loosen when the pencil is sharp. 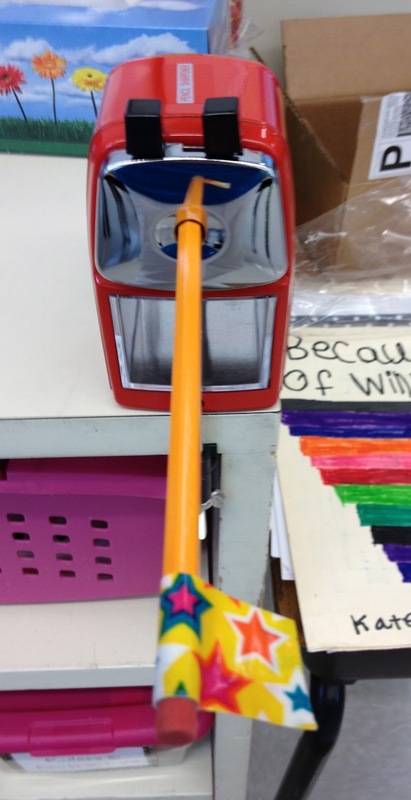 This sharpener is considered to be quiet, and I would most certainly agree. The sound of a pencil sharpener can really wear on you. I noticed right away how quiet this one is. That doesn't mean it's silent, but it IS substantially quieter than any other classroom sharpener that I have used. It was time to squeeze again, this time pushing it in so I could finally see my newly-sharpened pencil! 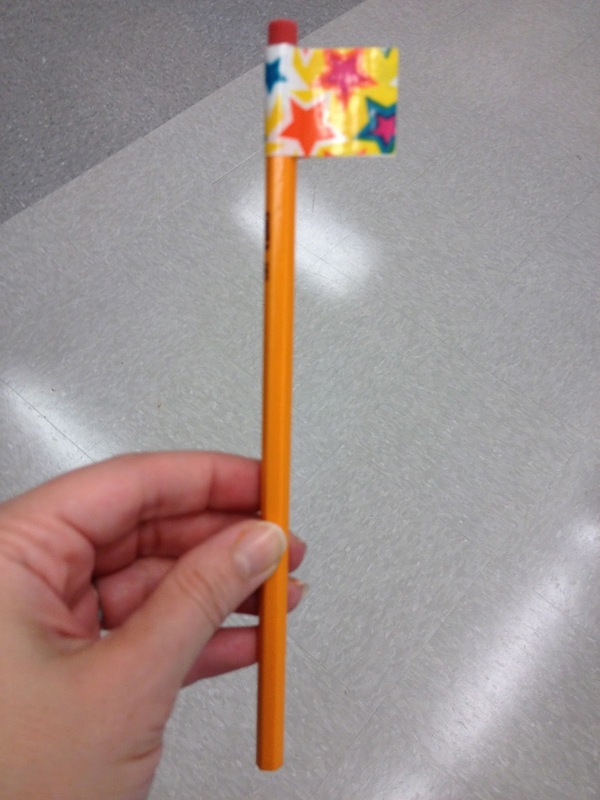 Are you ready for most amazingly sharp pencil ever?? No breaks or bends, just a perfectly sharpened pencil! How amazingly sharp are those pencils? 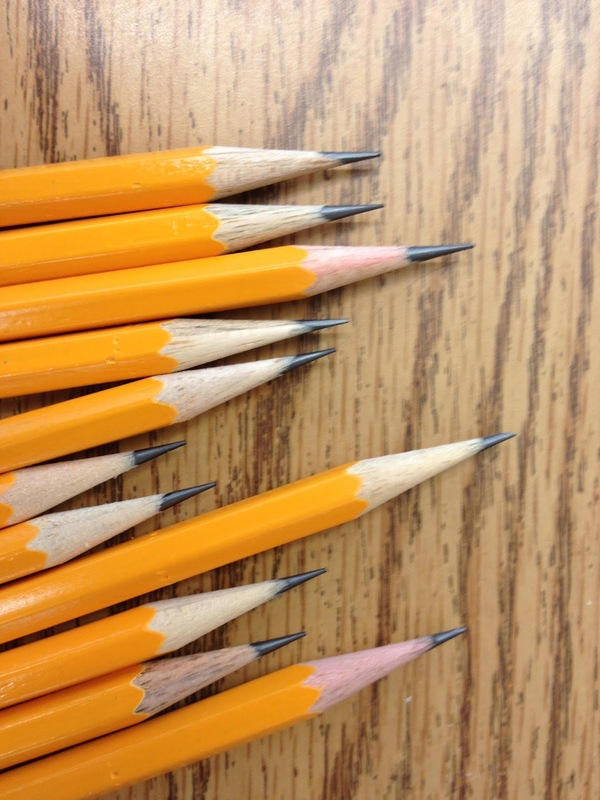 Now, if you are like me and press down really hard, this really sharp point might concern you because you've broken many a sharpened pencil, but I can tell you for sure that this was not the case with these pencils. I don't know what little magic fairy dust was spread on this sharpener, but it's a sharpener that sharpens the pencil, not breaks or weakens it. I threw out my electronic pencil sharpener that pulls 9 out of 10 leads out each time I use it. I will look no farther than this product from now on. 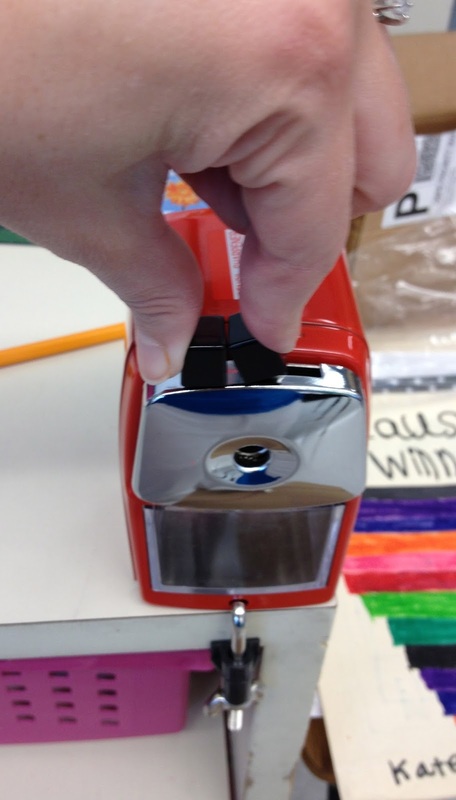 I am greatly impressed with this sharpener. If you are on the fence on this one, get off that fence and buy one. I'm already planning to purchase some for friends. For the product, the price is fantastic. I've spent up to $75 on sharpeners that never sharpened like this. I'd gladly spend $25 on a reliable product. I also love that there are replacement parts available at reasonable prices so that you wouldn't have to buy an entirely new sharpener. Oh, and another bonus: if you get together with a few colleagues and purchase them together, you can get a really sweet discount! 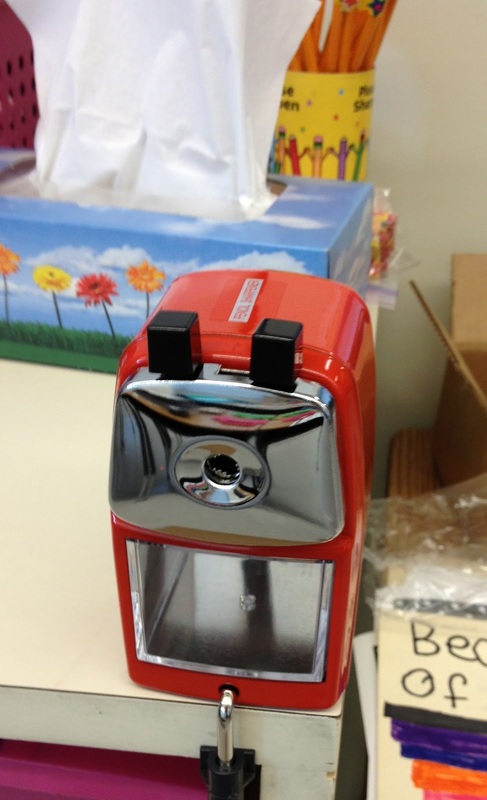 So many wonderful reasons to make this sharpener a must have in your classroom right now! I really should buy one...cause I've yet to see one negative review about it! Go for it! There's also tons of giveaways out there. 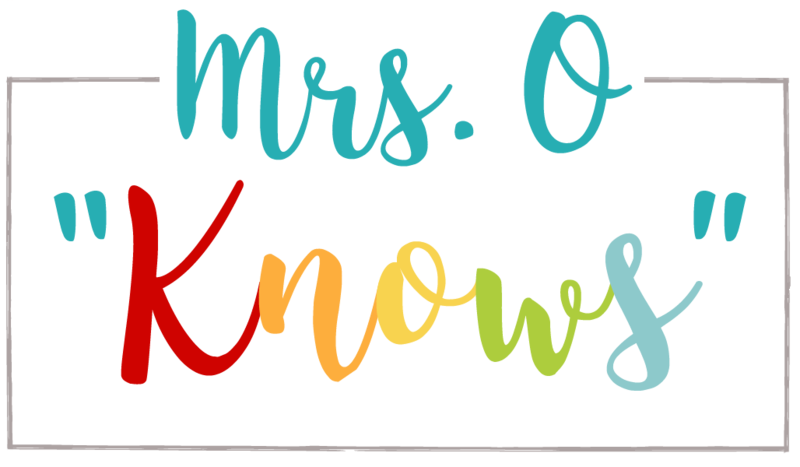 I'm hoping to host one when we get a little closer to Back to School too! I so want one of these sharpeners! I have nominated you for the Liebster Award. 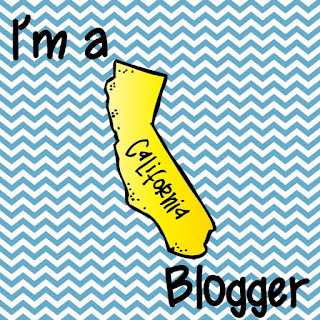 Should you wish to accept the award, please visit my blog for all the details! Thank you so much Najda! 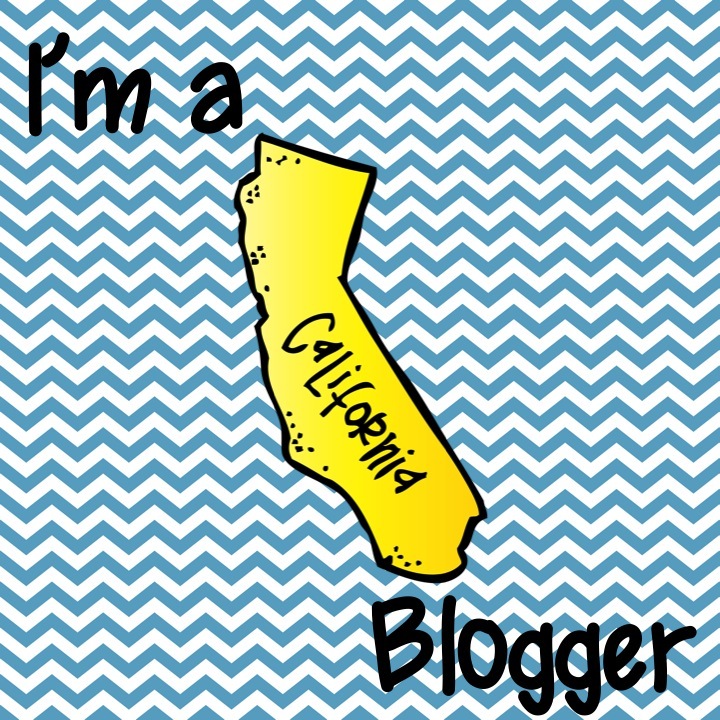 I am on my way to your blog to give you a follow and a comment of appreciation! You've made my day! SHARP and pretty thanks to my duct tape assortment! Wow! I'm going to have to look into one of those babies! You definitely should! I'm hoping I will be this in love with it at the end of the year too! 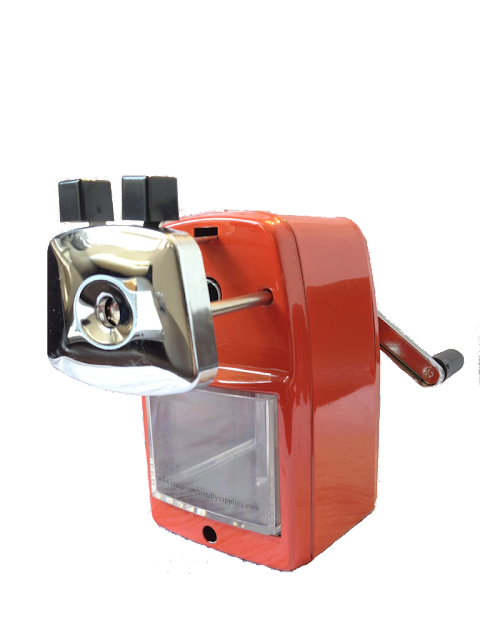 Do you think this is going to be a sharpener just for you or maybe a student job? I can see the annoyance of trying to 'teach' how to use it to 500 kids....but it does look so adorable!! Maybe we need one for the home instead of school! Thanks for the excellent review! I am thinking that it will be a student job. This way I can train the student with that job each week, and perhaps students will really want to do that job each day! 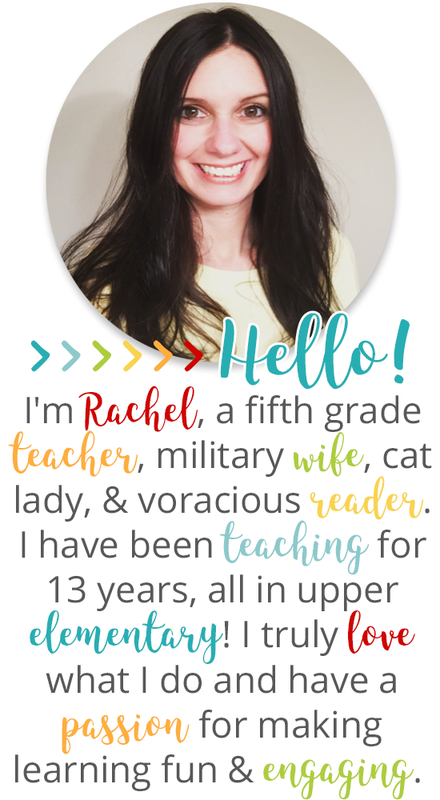 I'm also considering purchasing another "just the teacher" one to either keep at home or in a hiding spot in my room!